A right-wing party in Australia discussed softening the nation's strict gun laws as it sought donations from a US lobby group in a bid for greater political power, video recordings show. Representatives from One Nation, an anti-Islam minor party, met with the National Rifle Association last year. Australian PM Scott Morrison says the videos, secretly filmed by Al Jazeera, showed "deeply concerning" discussions. The representatives say they had been drinking when they were recorded. On Tuesday Mr Morrison asserted that Australia's gun laws were the "world's best", adding "we will not be changing them". It comes in the aftermath of the killings of 50 Muslims in shooting attacks on mosques in Christchurch, New Zealand. New Zealand Prime Minister Jacinda Ardern referenced Australia's gun law reforms - swiftly introduced after a 1996 massacre - before announcing her own crackdown last week. One Nation, led by Senator Pauline Hanson, won four seats in Australia's 2016 election, but it has since been plagued by defections and infighting. 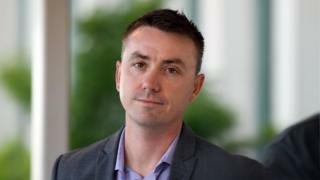 In September 2018, journalist Rodger Muller posed as a pro-gun activist and secretly filmed Ms Hanson's chief-of-staff, James Ashby, and another party figure, Steve Dickson, in Washington DC. Mr Ashby is filmed saying he wants to raise A$20m (£11m; $14m). Mr Dickson says: "If we could get that amount of money, imagine, we could change Australia." He adds: "We are pro-guns and pro people in this party owning guns." It is unclear if the officials ultimately received donations. Al Jazeera reported the pair had approached the NRA and other conservative groups in the US, such as Koch Industries. Many Australian lawmakers expressed concern on Tuesday and called on Ms Hanson to explain the videos. Mr Morrison tweeted: "Reports that senior One Nation officials courted foreign political donations from the US gun lobby to influence our elections [and] undermine our gun laws that keep us safe are deeply concerning." An independent senator, Derryn Hinch, said it was an "obscene" attempt to water down Australia's gun laws. The government said it also raised questions over whether One Nation may have breached laws which ban political donations from foreign groups. On Tuesday, One Nation said it "strongly supports the rights of lawful gun ownership within Australia". It criticised Al Jazeera as a "propaganda arm of the Qatari government", and said it had referred the news organisation to Australian police over "foreign interference" concerns. The high-profile media network has defended its editorial independence in the past. In a press conference, Mr Ashby and Mr Dickson, the two representatives recorded, said they had been drinking for "three or four hours" when the discussions took place. Mr Ashby said: "I will be the first to admit, we'd arrived in America, we got on the sauce, we'd had a few drinks and that's where those donations took place - not with any potential donors, no one but Rodger Muller, Steve Dickson and myself." Mr Dickson said journalist Rodger Muller "seemed to be a reasonable guy" and "wore the akubra hat." He said: "I never ever suspected in my wildest dreams that this guy was employed by a Middle Eastern country, by Al Jazeera, as an Australian spy to interfere with Australian politics. "This is the stuff you see in James Bond movies." What are Australia's gun laws? Australia overhauled its gun laws after 35 people were killed in a mass shooting in Tasmania in 1996. The changes banned semi-automatic and self-loading weapons, and introduced tougher requirements on purchasing guns. Firearms must also be registered, and owners must have a licence. The number of Australia's mass shootings dropped from 11 in the decade before 1996, to two in the years since: the murder-suicide of a family of five in New South Wales in 2014, and the murder-suicide of a family of seven in Western Australia last year. Gun control advocates have argued that aspects of Australia's laws have been eroded in recent years.